Take a look at this excerpt from our 2018 State of Partnering report and feel free to geek-out with our 2018 survey data* on program elements. How do you stack up to other vendors? Enablement – Do you have your priorities straight? The most critical element for success is partner enablement. Solution providers must be properly enabled to market, sell, implement, manage, support and service your products within a customer environment to reach some measure of joint success. Over two-thirds of the vendor respondents* indicated the partner enablement priority is selling the value and differentiation of their products. Vendors never believe partners have a clear understanding of the value their specific products bring to the customer or how they are differentiated from competitive products. The vendor respondents chose this as the greatest need for partner enablement for the past six years (since we started including it as an option) and it is hooey! Solution providers are already engaged in sales akin to the vendor’s products – either complementary or competitive. Vendors shouldn’t worry about it so much. The next highest ranked enablement priority is effective pre-sales discovery, with less than half of the responses of #1 (selling value and differentiation). Surprisingly, on the bottom of the vendors’ priority list is enablement for partners to develop a vertical solution and selling to a broader set of customers. That’s too bad as these two things would help vendors expand their overall sales in a differentiated way and with higher value (prices). Training and Certification – Think about vertical markets. 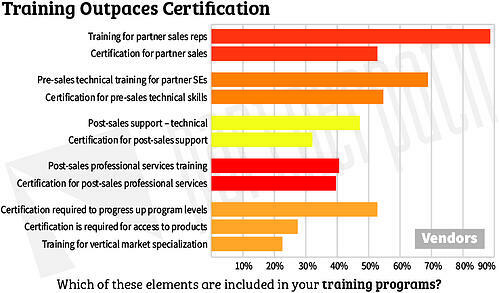 Drilling into the training and certification programs of enablement, the vendor respondents prioritize sales and pre-sales technical over post-sales support or professional services training and certification. This clearly shows vendors care more about landing customers than ensuring they are satisfied and successful. We believe the trend toward customer lifecycle selling – ensuring adoption, usage, success and loyalty – will soon be a concern of the channel ecosystem. In future years, we hope the training and certification emphasis shifts from landing customers to customer success related activities. Just over a fourth of the vendor respondents require some sort of certification to access their products – which may seem like a lot. However, we regularly see certification required for access to advanced technology, new products or cloud-based solutions. It’s surprising more vendors didn’t indicate certification was required for product access. We are also shocked and a bit miffed only half of the vendors indicated certification is required to progress up the program levels. We really hope the other 50% aren’t only using sales volume to advance partners into the upper tiers. After ten years of extolling the virtues of value-based metrics such as certifications and customer success in advancing partners into the higher program levels, if 50% of vendors are solely using sales volume, there is still a lot of work to do. And yet, 28% of the vendors indicated partners need to be certified to offer even their own professional services around the vendor’s product. What right do vendors have in dictating qualifications a partner must have for offering their own services and support to their end-customers? Vendors are missing a big opportunity to grow their partner sales, satisfaction and success by not putting a higher priority on vertical market opportunities. Solution provider businesses are becoming more differentiated as cloud adoption grows. They are creating niches of expertise in vertical markets, line-of-business selling and specific technology solutions. Where do you fall in these vendor metrics? Are your enablement priorities helping partners to be successful? Let us know by leaving a comment below.